In some ways Petzold’s Barbara plays like a pastoral version of The Lives of Others, but it’s more mellow drama than melodrama. Petzold holds back almost everything, his directorial style perhaps meant to mirror the psyche of those who lived under the Iron Curtain in East Germany and had to watch their every move while being monitored by the State. Details of Barbara’s past, as well as the pasts of others are sparse. Petzold mostly shows, rarely tells. Classical music, a famous Rembrandt painting and The Adventures of Huckleberry Finn are woven effortlessly into the story to add layers and fill in pieces of character development. Most things are to be inferred, and he’s blessed with Hoss’s controlled performance where she reveals little outwardly but speaks volumes with her eyes and restrained body language. She eventually warms up to a colleague as they bond over their patients and he shares a painful (perhaps embellished?) back story, but it never reaches the boiling point. Barbara eventually has to make a decision, one where the innate desire to escape and survive is put up against her medical ethics and drive to help others. 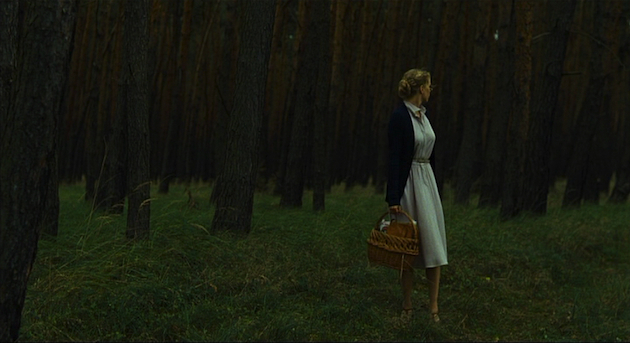 Petzold evokes this struggle through two striking series of images: First, about a quarter of the way through the film, Barbara – with her blond hair, dark blue sweater and a basket – goes deep into a shady grove for a rendezvous with her lover who has been plotting her escape. She seems both lost and found, her lover’s arms a comfort, but a fleeting one at best with Petzold’s images evoking a modern fairytale (quite apropos for its rustic German setting) . Second, near the end of the film, on a cold moonlit seashore, Barbara makes a great personal sacrifice, braving the wind and sand battering her face, letting another take her place, as her freedom disappears into the deep blue sea. Yet, the next morning, when Barbara turns up unexpectedly and quietly takes a seat across from her colleague at the bedside of a critical patient, we realize her decision to stay was just as much an act of revolution as the person who tore down the first brick from the Berlin Wall. Barbara rewards those patient viewers willing to dig deep for meaning, and further strengthens Petzold’s reputation as one of international cinema’s finest talents. This entry was posted in Art-house Cinema, History, Movie Reviews, Movies, Politics, Psychology and tagged Barbara, Christian Petzold, Doctors, East Germany, German Films, Germany, Nina Hoss, Period Piece, Police State, The 1980's. Hi there, where can I see this film? Sounds rivetting. Cecilia – if you go to the US distributor’s website (http://www.adoptfilms.com/) and click on the icon for BARBARA – it will list the theaters where it is currently showing (or will be showing soon). I saw it in Philly this weekend. No word of a bluray/DVD release stateside yet. Thanks so much for your reply. I can’t believe I have been missing such great foreign and independent films. Here in South Florida, there is a sad lack of media hype about any of these films. Good cinema is indeed hard to find. I’m happy to spread the word when it is found. A wonderful review. I saw this film in a local art-house theatre and thoroughly enjoyed it, albeit at times felt it could move a bit faster. However, I liked the lingering and the longing. Don’t you think the ending is just like Casablanca? That struck me right away as soon as I saw the speed boat come to shore. Arti – I agree about the pacing…but in hindsight it was fitting. I hadn’t thought of Casablanca until you mentioned it, but you are right! David, as I guess you may have read at my own site, I was no fan at all of this film, as I found it tedious and aloof. But I full understand that I am in an extreme minority, and well appreciate your excellent and passionate review here!